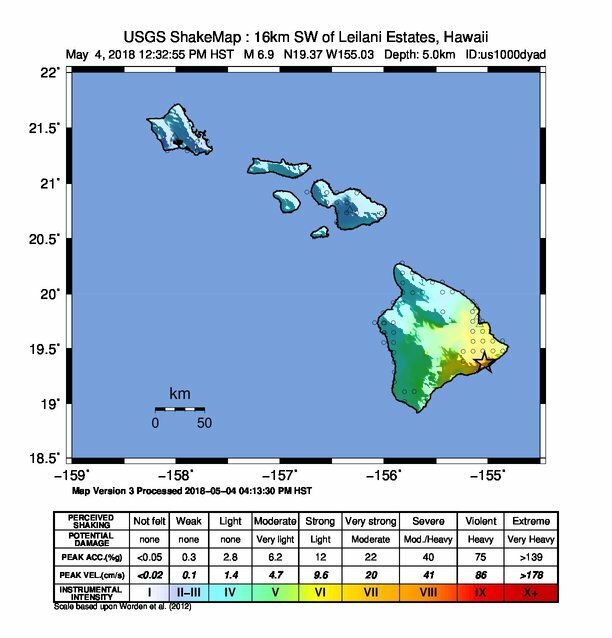 Shakemap for the 2018 Hawaii earthquake. The Kilauea earthquake of May 4, 2018 occured at 12:33 p.m. local time measuring 6.9 on the moment magnitude scale. The epicenter was near the south flank of Mt. Kīlauea, which had been the site of seismic and volcanic activity since late April of that year. The same region was also affected by the 1975 earthquake. Astrogeographic position of the epicenter for morphogenetic field level 1 which defines the international, supraregional resonance and meaning of the event: one coordinate for the astrogeographical latitude of the epicenter lay lies at 15°Sagittarius exactly squared by Neptune from 15°Pisces. The coordinate for the astrogeographical longitude lay at 29°Scorpio. Neptune´s exact square transit to Mt. 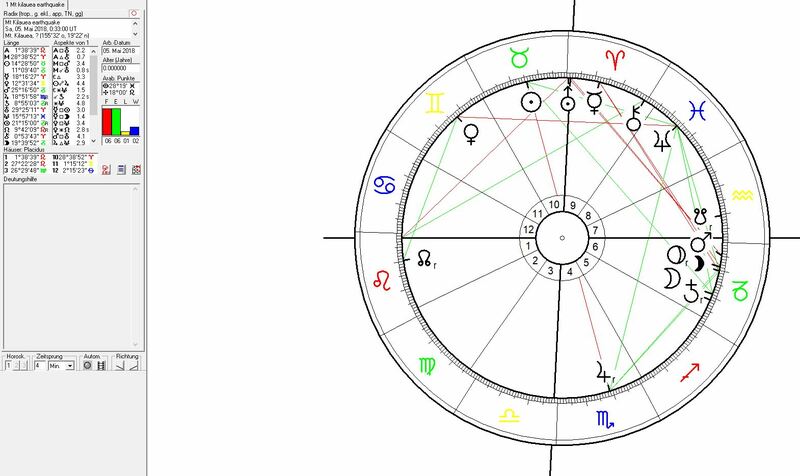 Kilauea`s 15° Sagittarius position from an 8th house position indicates the destabilization of the situation at Mt. Kilauea through the dissolution of solid structures to the south west of the epicenter. Uranus was conjunct midheaven at the moment of the earthquake indicating an eruption of material – possibly a mgma chamber above the epicenter. Uranus near midheaven or on the IC (or else house 4) is a frequent factor for earthquakes. The midpoint between the two major planetary factors of stability Saturn (at 8°55`Capricorn) and Pluto (at 21°15`) fell near exactly on 15°Capriorn and thus in strong resononance through mirrorpoint conjunction with the astrogeographical coordinate of the epicenter at 15°Sagittarius indicating a situation of sandwich – like forces and pressure exerted onto the material at the epicenter.